When I was in college in 1966 there were two Marine sergeants going through the “Bootstrap” program in which they were allowed to attend college on Marine time with the condition they would return to active duty as second lieutenants upon graduation. Both had served in Vietnam the previous year (1965) and had stories to tell. One of the most interesting was coming into a Vietnamese village and coming under sniper fire. The platoon leader called for help and an Ontos drove up to deal with the sniper. The VC, upon seeing the armored vehicle, jumped down from his tree spot and began to run for his life. 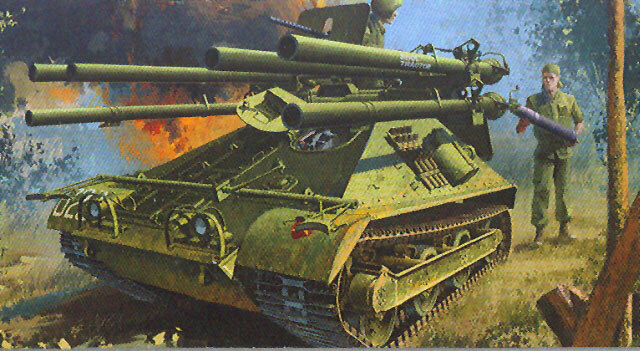 The Ontos fired one of the recoilless rifles at him – and missed. Again. Miss. Again. Miss. After the sixth shot - and miss – the commander popped the hatch, lined up on the now distant VC and fired the .30 caliber Browning, taking him out with one burst. So much for fire support. This curious little vehicle, which began as an Army tank destroyer project in the early 1950s, wound up going to the Marines as it was light enough and small enough to be easily deployable and still provide heavy firepower and antitank capability when needed. In the late 1950s Renwal, whose only armored vehicle kits were of US Army vehicles from the “Pentomic” Army period, released a 1/32 scale kit of one with lots of moving parts, a crew and “no-show” gluing (e.g. you had to attach most parts from the inside, not the outside). A popular model of the time, as with many other kits it suffered from “sort of” scale approaches and oversized moving parts, as well as some rough construction problems - for one, it was nearly impossible to get the barrels straight no matter how hard you tried. Over the years two 1/35 scale resin kits came out, but both were very fiddly and expensive. Now Academy has come to the rescue with a brand-new kit in 1/35 scale which is much closer to the real vehicle and appears to hit the target. In the interests of full disclosure I did provide a good deal of information to Academy via MRC for this kit – markings information, a complete set of plans, and a complete set of photos and drawings from the USMC operator’s manual for the vehicle. While most of the latter covered the interior – and there is not a bit of interior in this kit even with the huge number of parts – the exterior parts appear to have been closely matched to the info I provided as well as that Academy researchers found elsewhere. The kit comes with a four-piece hull – top, bottom and upper and lower rear plates – with slide molding used to get the details on the lower hull. The suspension is quite complex but matches what info I have on the vehicle and is designed to permit all of the wheels to rotate; a standard Academy set of vinyl keepers is included but only 10 of 24 parts are used. The shock absorbers are also included and care must be taking in installing them in Step 4. The flip-down ammunition door (which was overscale but worked on the Renwal kit) is included as a separate part, but there is no ammo bay and it simply covers the opening for one. The grille doors for the engine compartment are separate parts, but while the service access to the engine is open the rest of the compartment is closed off and the grilles simply cement to the top of the hull. The travel lock for the rifle assembly is fixed but the modeler has a choice of up or down. Etched screens are provided for the muffler assembly and care will be needed as part PE7 is a cone shaped connector which must be formed from flat brass. While there are a number of etched brass bits included, the kit main directions are more than a bit obtuse on how to use the rest or even where! I think they include straps for the rear mudguards (PE5 and PE9) and brackets for the muffler guards plus a replacement (PE12) for the driver’s periscope guard (B63), plus a set of 16 bolt heads. A better description is given on the finishing sheet along with locations. The rifle assembly is very complete, with each rifle comprising 14 parts (lowers) or 17 parts (uppers) for those weapons with and without spotting rifles respectively. Note that the lower weapons do not mount spotting rifles when installed in the rifle assembly, even though they are shown in Step 12. (They can be mounted if the rifles are removed from the assembly and used in an M40C arrangement on a tripod ground mount). The breeches appear to be posable in the “open” position. The Vietnam added armor plate for the .30 caliber machine gun is also included. Note that the rifle assembly is fixed in place and cannot be elevated or depressed, albeit it can be set with some work during installation in Step 9. The tracks are one-piece vinyl runs and look the part - steel bars bolted to a rubber base to form a continuous tracks (note that this is pretty much one reason why you do not see many preserved Ontos vehicles with tracks as once they start to deteriorate they are hard to fix or replace - the APG one is a typical victim). There are three small nubs on the outer face which require trimming, but the detail and flexibility are very good. The only glitch I ran into with the kit are the rifles. Each one is a tad underscale (overall the barrels are right at 106mm in scale - 3mm - or about a scale 8-10mm too small in diameter. With a coat of paint, this is mostly insignificant and they do look the part. However, the four ammo rounds provided for them are overscale and are about 122mm instead. If you use them - as the shapes are close and MUCH better than the “giant bazooka rounds” Renwal fancifully supplied – don’t place them too close to the rifle breeches! The two figures are very well done and tailored to the vehicle. The commander has a “bone dome” with one-piece goggles and the loader has a “do rag” bandanna. Note that the figures as molded are better than the prototypes in the directions on details! One finishing option is provided, “Soul Tractor” which is straight from the Osprey book on US Armor in Vietnam. This time the markings match the photos. Overall, while a bit of interior could have made it an even better kit, it should please most modelers and is one of the best efforts from Academy.